The transition years from Far West to the exodus to Nauvoo were fraught with terror for many. As soon as it was evident "God" was not delivering victory to Joseph Smith's Missouri plans of 1838 we see how loyal Danites began moving north. We see most of the Church leaders being arrested by the United States government. A trail is put together and we read the testimonies of those who turned states evidence against their brother Danites, Joseph Smith and the Church itself by revealing his early involvement. Joseph Smith was arrested, tried and convicted. He began serving his sentence in Liberty Jail in Missouri until he was able to escape through bribing his guards. As a fugitive from justice he moved to Nauvoo Illinois on May 10, 1839. During this period the need for "Danite" style security was even more in need. This expansion was seen in the charter Joseph Smith was able to obtain for his new city of Nauvoo which included a police force and militia called the Nauvoo Legion. There were many officers involved in these forces which enabled his security needs to be accomplished. As we examine the history and development of the way justice was administered in the Nauvoo period we see evidence that "Danite' methods were employed when needed. They were given a very liberal charter by their new governor and legislators in Illinois. John C. Bennett was elected mayor. Alderman were William Marks, Samuel Smith, Newel K. Whitney, and Daniel H. Wells. Councilors were Joseph Smith, Hyrum Smith, Sidney Rigdon, Charles C. Rich, John T. Barnett, Wilson Law, John P. Greene, Don Carlos Smith, and Vinson Knight. Marshall was Henry G. Sherwood. 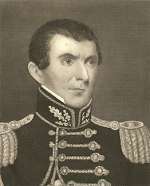 Joseph Smith was elected lieutenant general of the Nauvoo Legion. Joseph Fielding Smith, church historian wrote this about early legal language in Nauvoo. "Should any person be guilty of ridiculing and abusing, or otherwise deprecating another, in consequence of his religion, or of disturbing or interrupting any religious meeting within the limits of this city, he shall, on conviction before the mayor or municipal court, be considered a disturber of the public peace, and fined in any sum not to exceed five hundred dollars, or imprisoned not exceeding six months." On May 6, 1842 was shot while sitting at his residence in Independence Missouri. After Boggs survived the shooting he went before Samuel Weston, justice of the peace in Independence and charged Orrin Porter Rockwell with the crime.